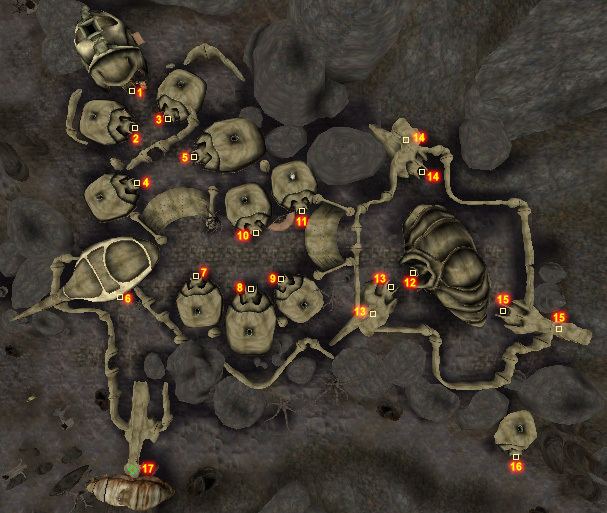 Maar Gan (also called the Markgran Forest) is a tiny temple town deep in the Ashlands to the north of Ald'ruhn. 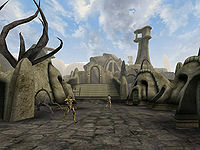 It is walled and built in the House Redoran style, utilizing mud construction and the shells of ancient monstrous insects. It is probably as close to the Ghostfence as any town short of Ghostgate itself and offers few services. There is a Tribunal Temple shrine there, with a captive Dremora, Anhaedra, who has spent many thousands of years perfecting the ultimate insult. 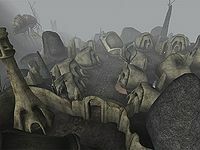 Maar Gan is home to House Redoran volunteers making a stand against the Blight. High guard towers offer some advanced warning against the frequent cliff racers that attack villagers. Along the city walls, the outpost across from the silt strider offers some training. Manse Andus is the publican offering beds and sundries in the Andus Tradehouse. Downstairs, Bugdurash gra-Gashel and Aerin offer some training. The healer Tashpi Ashibael's hut is south of the stairs to the temple. Someone in the Mages Guild says she's a necromancer. The priest Salen Ravel is a spellmaker and sells potions and ingredients. 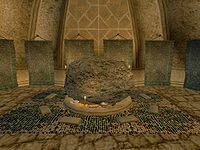 The Pilgrimage to Maar Gan will lead you here to reenact some of Lord Vivec's deeds. The Dremora Anhaedra is forever bound to this plane, right here in the shrine. Aerin is the master trainer of Light Armor in the Andus Tradehouse. The silt strider port is along the south wall. Daras Aryon can take you to Ald'ruhn, Khuul and Gnisis. The Foyada Bani-Dad leads north, deep into the Ashlands, Khuul and the camp of the Urshilaku tribe. The dust-swept road to Ald'ruhn is filled with blighted creatures. Huleen's Hut is located outside the city walls, along the road and straight east from the strider. The Falasmaryon Propylon Index is lying on a plate at the big rock in the shrine. Tashpi Ashibael's hut will be abandoned after the quest involving her. It can make a small, but cozy home. The Guard Towers have crates with Bonemold Armor. You can check them all for a full set. The Sixth House base of Mamaea and the site of the Redoran Stronghold, Bal Isra, are about halfway south on the road to Ald'ruhn. Kill Necromancer Tashpi Ashibael: Investigate a possible case of necromancy in Maar Gan. Huleen's Hut: Investigate reports of disturbances from Huleen's Hut in Maar Gan. Withershins: Pick up a copy of this rare book. Remove the blight from the Hairat-Vassamsi Egg Mine: In the Maar Gan Outpost there is a small but touching memorial to Ravila Neryon, "killed while crusading to remove the blight from the Hairat-Vassamsi Egg Mine". Take it upon yourself to complete her mission.